NEW YORK -- Both candidates concluded the first presidential debate by saying they will accept the outcome if the other wins. Hillary Clinton spoke directly to viewers and said, "It's not about us, it's about you." Donald Trump initially dodged the same question, saying he would make a "seriously troubled" America "great again." He added: "I'm going to be able to do it. I don't believe Hillary Clinton will." But Trump finished his answer by saying that if Clinton wins, "I will absolutely support her." Hillary Clinton is punching back at Donald Trump's assertions that she doesn't have the "stamina" to be president. 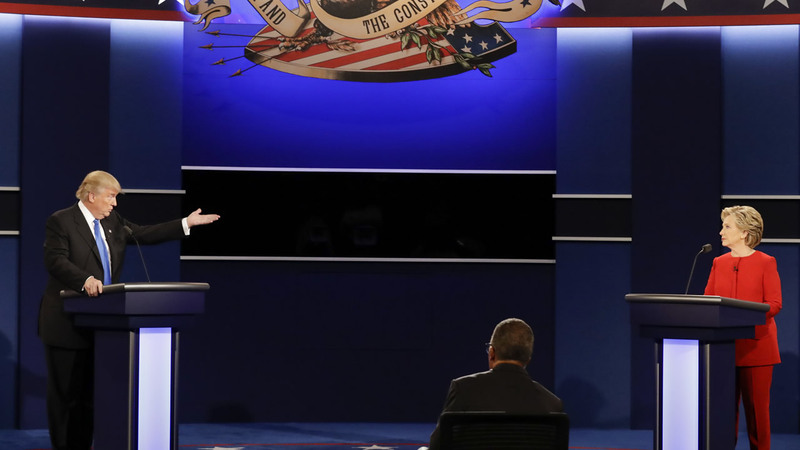 Trump has questioned whether Clinton has the physical fitness to be president and he repeated the criticism to her directly during the debate. Clinton's response? Trump shouldn't talk about stamina until he's tried out the busy schedule she kept up as secretary of state. Trump didn't answer moderator Lester Holt's original question about his past comments that Clinton doesn't have the "presidential look." Clinton suggested the remarks were about gender, and she reminded the crowd of Trump's past comments calling women "pigs" and other derogatory names. Donald Trump says NATO needs to "go into the Middle East with us" to combat the Islamic State group. And he is taking credit for NATO focusing resources on combating terrorism. In fact, the alliance agreed in July to contribute aircraft and conduct training in Iraq and has increased intelligence coordination there. And NATO set up an anti-terrorism program in 2004 - years before Trump criticized them as a presidential candidate. Earlier this year, Trump criticized NATO for not focusing on terrorism. He said that afterward, he saw an article reporting that NATO was opening a new, major anti-terrorism division. He said Tuesday that NATO's action was "largely because of what I was saying, and my criticism of NATO." Donald Trump is avoiding a specific declaration on how he would use nuclear weapons if he's elected president. The Republican nominee said during the first presidential debate that he "would not do first strike" because "once the nuclear alternative happens, it's over." That statement suggests he would not authorize a nuclear attack unless the U.S. was struck first. But in the same answer Trump said he "can't take anything off the table." He mentioned adversary nations such as North Korea and Iran. President Barack Obama has considered changing existing policy to state clearly that the United States would not deploy nuclear weapons without first being attacked by nuclear weapons. But he met resistance and has elected not to make such a shift. Hillary Clinton is accusing Donald Trump of being too easily provoked to keep the United States from going to war - perhaps even one involving nuclear weapons. Trump says: "I have much better judgment than she does. I have much better temperament." That drew laughs from some in the debate crowd, and prompted Clinton to exclaim: "Woo! OK!" Clinton then pivoted to policy, defending the U.S.-led war in Afghanistan. Clinton said Iran was "weeks away" from a nuclear bomb when she became secretary of state - and says the Obama administration thwarted that progress. She continued that Trump didn't have "good judgment or the right temperament" because he could take the country to war over small issues, like being mocked on Twitter. Donald Trump is continuing to insist he opposed the Iraq War before the U.S. invasion despite evidence to the contrary. Trump says during the debate that he "did not support the war in Iraq," calling that charge "mainstream media nonsense." But there is no evidence Trump expressed public opposition to the war before the U.S. invaded. Trump was asked in September 2002 whether he supported a potential Iraq invasion in an interview with Howard Stern. Trump briefly hesitated, then responded: "Yeah, I guess so." Presented with the comment during the debate, Trump responds: "I said very lightly, I don't know, maybe, who knows." He's also telling reporters to call Fox News host Sean Hannity to confirm private conversations he said they had about the war. Hannity is a top Trump supporter. Clinton voted in favor of the invasion in 2002 while she was a New York senator. She has since said it was a mistake. Donald Trump is interrupting the moderator of the first presidential debate to insist he has the best temperament for the office. Trump repeatedly made the assertion after clashing with moderator Lester Holt over his early support for the Iraq War. Then he segued to his temperament. "I think my strongest asset by far is my temperament," Trump said. "I know how to win." Clinton and her allies have repeatedly hit Trump over his temper and inability to take criticism. Hillary Clinton says one key to fighting terrorism in the United States is working closely with Muslims living here. Clinton says Donald Trump has "consistently insulted Muslims abroad, Muslims at home." She says Muslim people can provide information that law enforcement may not be able to obtain anyplace else. Both candidates were asked to explain how they would combat terrorism in the U.S.
Clinton says her plan includes an intelligence surge to obtain "every scrap of information" and to "do everything we can to vacuum up intelligence from Europe, from the Middle East." Hillary Clinton says defeating the Islamic State group and taking out its leaders would be a top priority as president. Clinton says she's hopeful the Islamic State group would be pushed out of Iraq by the end of the year. She says the U.S. could then help its allies "squeeze" the terrorist group in Syria. Clinton says she would do everything possible to take out the group's leaders, and make that one of her administration's organizing principles when dealing with the Islamic State. The Democratic presidential nominee says the U.S. should also be working to disrupt the group's online propaganda efforts. Donald Trump is hitting back at Hillary Clinton after she reminded voters watching the first presidential debate that dozens of former Republican national security officials have endorsed her. Trump claims he has the backing of more than 200 former admirals and generals, including scores who have already endorsed him. He suggests the Republicans who have endorsed Clinton are "political hacks." He did not name any of Clinton's backers but argued sarcastically that the "hacks ... have led our country so brilliantly over the last 10 years." He added, "Look at the mess we're in." Hillary Clinton is warning against the spread of cyber-attacks in the United States, particularly from Russia. The Democratic nominee says the United States "is not going to sit idly by" and let hostile nations attempt to hack public or private information. She called out Russia and dinged Donald Trump's frequent praise of Russian President Vladimir Putin. Clinton also criticized Trump for inviting Russia to find her emails. Trump interrupted Clinton, saying "Wrong" when his opponent mentioned his praise of Putin. Hillary Clinton says Donald Trump started his political career by claiming President Barack Obama was born outside the United States. Clinton accused Trump of spreading a "racist lie" that our "first black president" was not an American citizen. Clinton added, "He has a long record of engaging in racist behavior." She said the so-called "birther" issue was a lie, and "a very hurtful one." Clinton called Obama a man of dignity and said the issue "bothered and annoyed him." Trump responded by recalling bitter debates between Clinton and Obama during the 2008 Democratic presidential primary. He said Clinton treated Obama then with "terrible disrespect." Hillary Clinton says Donald Trump's view of black communities is too grim. Trump's reaction to her remark? A sigh and an eye-roll. Trump spoke during Tuesday's debate about the need for law and order, one of his favorite campaign themes. He says that includes inner cities, where he says blacks and Hispanics are "living in hell because it's so dangerous." Clinton says it's too bad that Trump "paints such a dire, negative picture." She says those neighborhoods create businesses and violent crime in them has come down. She says to reduce "systemic racism" in the justice system, she favors eliminating mandatory prison sentences and creating more second-chance programs. FBI data shows the national violent crime rate peaked in 1991 and has fallen by about half since then. Donald Trump and Hillary Clinton are coming to rare agreement about a contentious gun issue. Trump tells Clinton, "I agree with you" when it comes to not allowing people "on a watch list or a no-fly list" from buying guns. He says, "We have to look very strongly at no-fly lists and watch lists." Some gun rights activists have made the case that people can be placed on such lists accidentally. But Trump says if people are on lists and shouldn't be "we'll help them, we'll help them legally, we'll help them get off." Clinton had said earlier that she believes, "If you're too dangerous to fly, you're too dangerous to buy a gun." Donald Trump is blaming Hillary Clinton for starting the false claim that President Barack Obama was born outside of the United States. Trump says Sidney Blumenthal worked for the Clinton campaign in 2008 and pushed the belief that Obama was born in Kenya. Blumenthal did not work for the campaign. The Republican nominee also says former Clinton staffer Patti Solis Doyle admitted that a member of the Democrat's team tried to push the same falsehood. Doyle said the campaign fired a low-level staffer who tried to spread other rumors about Obama's religion. Trump said Clinton "failed to get the birth certificate." He then said, "When I got involved, I didn't fail." Hillary Clinton says she doesn't have to apologize for being prepared. Donald Trump got in a dig at Clinton's absence from the campaign trail. He said he's seen troubles in inner cities while she's stayed home. Clinton responded that there was nothing wrong with spending time preparing for the debate. "You know what else I did?" she asked. "I prepared to be president." Donald Trump is talking about the importance of "law and order" in response to the moderator's question on how to heal racial divides. He says if we don't have it, "we're not going to have a country." He says that in inner cities, African-American and Hispanic communities "are living in hell because it's so dangerous." Trump says that if you walk down the streets in places like Chicago, "you get shot." He goes on to cite the controversial "stop-and-frisk" policing tactic as a way to bring down crime. "Right now our police are afraid of doing anything," he says. A federal judge ruled "stop-and-frisk" unconstitutional. Hillary Clinton says fixing race relations comes down to two things: restoring trust between police and communities of color and reforming gun laws. Clinton says gun violence is the leading cause of death among young African-American men. She says tackling the "plague of gun violence" is critical. She says race remains a "significant issue" that too often determines where people live and go to school and how they're treated in the criminal justice system. Hillary Clinton is attacking Donald Trump on his business record, saying she's "relieved" her late father never had to work with the billionaire businessman. Clinton said Trump has "stiffed" thousands of workers and small business owners and he should apologize to them. She also says an architect who designed a clubhouse for one of Trump's golf courses and was not properly paid was in the presidential debate audience. Clinton's father, Hugh Rodham, was a successful textile merchant. The Democratic presidential nominee says Trump's business record, including his companies' multiple bankruptcies, show he'd be a poor president. But Trump is defending his business prowess, saying many of his ventures had been successful and he has numerous business partners who were happy to work with him. Hillary Clinton says Donald Trump has a simple reason he won't release his tax returns: He's got something to hide. The Democratic presidential nominee has some ideas what it might be. She says during the first presidential debate that Trump may not be "as rich as he says he is." Or "maybe he's not as charitable" as he says he is. Clinton says perhaps Trump doesn't pay any federal income tax at all. She noted that some of the Republican nominee's income tax returns in the 1970s showed Trump paid no federal income taxes in certain years. Trump disclosed the returns to New Jersey casino regulators. Hillary Clinton says she's taking responsibility for using a private server to get State Department emails. When Donald Trump said he would release his tax returns if his opponent released what he called her "33,000 deleted" emails, Clinton said, "I made a mistake using a private email" server. Trump interjected, "That's for sure" and Clinton shot back, "I take responsibility for that." Trump said Clinton forced support staff and technology officials to take the Fifth Amendment, rather than incriminating themselves in the subsequent investigation over her emails. Trump said voters wouldn't be blown away by his tax returns because "you don't learn that much from taxes." Donald Trump says he'll release his tax returns if Hillary Clinton releases the "33,000 emails" she deleted from her private server. Trump has refused to release his taxes, saying he is under a routine IRS audit and would release them when it's completed. The Republican nominee said Monday he would "go against" his lawyer's wishes and release them before the audit is complete if Clinton turned over the emails. Moderator Lester Holt noted that, by law, Trump can release his tax returns even while under audit. Clinton suggested the celebrity businessman is refusing to release them because he is hiding "something terrible" like a low tax rate or a small amount of charitable contributions. Donald Trump's has shown no hesitancy to interrupt Hillary Clinton as the pair dig into their first faceoff at Hofstra University in New York. In one exchange, Clinton said, "I have a feeling that by the end of this evening I'll be blamed for everything that ever happened." In another, Clinton said she made a mistake by using a private email system during her tenure as secretary of state. "That's for sure," Trump responded. Donald Trump says his tax plan may benefit the wealthy but it is also "a great thing for the middle class" because companies would invest more in building their businesses. He says companies want to create jobs but they often move their money overseas because "taxes are so onerous." Trump says Democrats and Republicans agree that the U.S. should cut a deal with companies to get them to bring their profits back. Yet politicians have not been able to make it happen, he says. Trump says there could be $5 trillion stuck overseas. He says, "With a little leadership, you could get it here really quickly," adding such a development "would be beautiful." Hillary Clinton says she was ready for Donald Trump to tell some whoppers in the first presidential debate. The Democratic nominee is directing voters to her campaign website, HillaryClinton.com. It's been converted into a real-time fact-checker intended to correct Trump's misstatements. She brought up the site when Trump was hammering her on taxes and regulations. He said he's "going into cut taxes big league. You're going to raise taxes big league. End of story." Clinton retorted that she "kind of assumed there would be a lot of these charges and claims." Clinton aides have said for days leading up to the debate they were worried that moderator Lester Holt would allow Trump to exaggerate and misstate facts. Lester Holt is letting the presidential candidates play. The moderator of first presidential debate between Hillary Clinton and Donald Trump is giving the candidates a wide berth to argue and talk over each other. Holt was largely silent as Trump and Clinton argued heatedly back and forth for several minutes over a variety of issues. In one lengthy exchange over international trade, Holt was silent while Trump and Clinton repeatedly spoke over each other with voices raised. The NBC News veteran, who is moderating his first debate, is being closely watched, particularly in light of a dispute over the extent to which he should call politicians out for making untrue statements. Donald Trump is blaming Hillary Clinton for what he says have been "defective" trade agreements that have cost American jobs. Trump says Mexico taxes American products imported there, but the U.S. does not tax Mexican imports. He says Clinton's been "doing this for 30 years," a reference to her long career on the American political scene. During that time, she's been first lady, senator from New York and secretary of state. Those are not jobs that would give her a primary role in crafting trade agreements. Trump also criticized the North American Free Trade Agreement, which was approved under President Bill Clinton, Mrs. Clinton's husband. The nonpartisan Congressional Research Service has said that 1994 deal had a "relatively small" impact on the U.S. economy. Donald Trump claims he never said climate change was a "hoax" created by the Chinese. Trump tweeted in January 2014 that, "Snowing in Texas and Louisiana, record setting freezing temperatures throughout the country and beyond. Global warming is an expensive hoax!" In November, 2012, he said, "The concept of global warming was created by and for the Chinese in order to make U.S. manufacturing non-competitive." His Democratic rival Hillary Clinton made the charge during Monday night. Trump is a denier of climate science. Donald Trump has the sniffles. Trump's loud sniffing in the opening minutes of Monday's first presidential debate with Hillary Clinton is getting plenty of attention on social media. Some are comparing it to Al Gore's sighing from the 2000 presidential debate. The noticeable sniffing, or loud breathing, is generating hashtags like #trumpsniff on Twitter. Much attention has been focused on both candidates' health going into the debate following Clinton's pneumonia diagnosis last month. Both candidates have since released details about their health history. Donald Trump says he wants Hillary Clinton to be happy. Clinton referred to Trump as "Donald" in their first face-to-to-face debate. Trump hesitated before referring to the Democratic nominee as "Secretary Clinton." "Is that OK?" Trump asked. "I want you to be very happy." Clinton is the former secretary of state. Trump has never held public office so he has no formal honorific title. Hillary Clinton is asking American voters to decide whether she or Donald Trump can "make your life better." The Democratic nominee opened the first presidential debate pitching her economic policies as the best way to help most voters. She added that voters should use the first of three debates to assess "who can shoulder the immense, awesome responsibilities of the presidency" and who can "put into action" their plans. She did not use the argument to attack Trump. She said only, "Donald, it's good to be with you." Hillary Clinton is criticizing Donald Trump early in the presidential debate over a loan he got from his father to start his business career. The Democratic presidential candidate is calling her Republican rival's tax cut proposals "Trumped-up trickle-down" economics. Clinton says Trump "really believes the more you help wealthy people, the better off we'll be." She also referenced a million-dollar loan Trump got from his father decades ago. Clinton criticized her opponent's aggressive stance on trade, saying the U.S. is "5 percent of the world population" and that means having to trade with the other 95 percent of the world. Donald Trump is kicking off the debate touting his plan to create jobs and claiming that Mexico and other countries are "stealing them." Trump says, "Our jobs are fleeing the country, they're going to Mexico and many other countries." He says, "We have to stop our jobs from being stolen from us" and is claiming that Mexico's factory building is like "the 8th wonder of the world." He's calling for renegotiating U.S. trade deals and says job creation will flourish under a Trump administration because of his plans to lower taxes and scale back regulations. Hillary Clinton is fielding the first debate question from moderator Lester Holt, who asked about her plan to create better jobs for American workers. Clinton, the first woman to participate in a general election debate, first noted that it was her granddaughter Charlotte's second birthday and launched into her standard campaign promise to fight for fair pay for female workers and to increase taxes on the wealthy. The first presidential debate between Democrat Hillary Clinton and Republican Donald Trump is under way. Clinton was heard asking, "How are you, Donald?" as they took the stage. Clinton is taking the first question. Police on Long Island say about 2,000 protesters have gathered outside the scene of the first presidential debate between Hillary Clinton and Donald Trump. Some of the diverse groups protesting Monday night's showdown at Hofstra University include Hardhats for Hillary, socialists and activists calling for a living wage. The protesters have been confined to an area several blocks long. Nassau County police say 24 people have been arrested on mostly disorderly conduct charges. Police gave no other details on the arrests. Former President Bill Clinton and Melania Trump shook hands as they were seated in the front row to watch Hillary Clinton debate Donald Trump in the first presidential debate at Hofstra University on Long Island. The two are seated with their families as the debate begins. The presidential candidates have arrived at Hofstra University in New York and are moments away from their first face-to-face debate. Democrat Hillary Clinton and Republican Donald Trump each entered the debate hall on suburban Long Island within the hour of the debate's start. The stakes are high. Clinton and Trump are close in the polls and the debate kicks off the final, six-week sprint of the general election. The two candidates are slated to square off for two more debates next month, while their running mates, Tim Kaine and Mike Pence, are set to meet next week. The debate will be moderated by Lester Holt of NBC News. Pence, Rudy Giuliani, Chuck Schumer, Don King, Bobby Knight and Mark Cuban are among the invited guests in the audience. Some unconventional supporters of the presidential candidates are packing the spin room where reporters are awaiting the first debate of the general election. They include a trio of sports figures: Eccentric boxing promoter Don King, dressed in a bedazzled denim jacket, former Indiana basketball coach Bobby Knight and billionaire Dallas Mavericks owner Cuban. Also working the room is Trump's running mate Mike Pence. He's being followed by a pack of reporters as he crisscrosses the media filing center doing interviews. Cuban tells reporters he's not sure where he'll be sitting in the debate hall. But the Hillary Clinton supporter says he knows why he's backing the former secretary of state. He says with Trump, "There's just too many uncertainties" and "we don't know where he stands in terms of the balance of power in the world." Due to the presidential debate, tonight's "Jeopardy!" will be seen at 10 p.m. and "Wheel of Fortune" at 10:30 p.m. on ABC7. The presidential debate began at 6 p.m. on ABC7. For full coverage on the presidential election, click here.